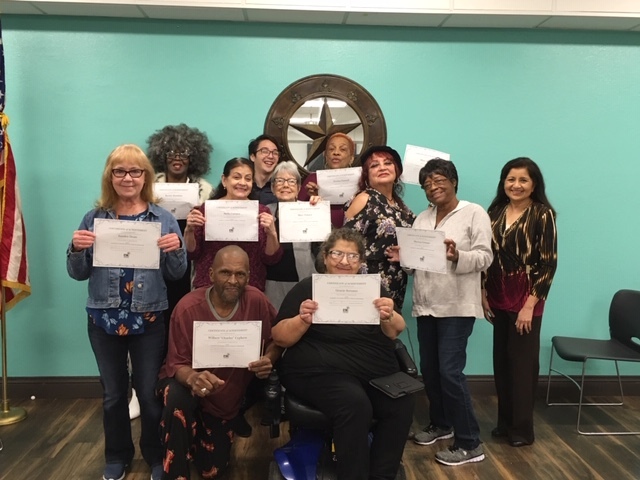 A staple of the North Loop Apartments community, Bessie Hawkins (shown here in the back left-hand corner) brought an unmatched energy to her Connect @ Home tablet class. Each day, Bessie greeted her trainer and her fellow students with cheer. The room would fill with smiles as she strolled in, always wearing an elegant gown or sophisticated pantsuit for class. Her personality was evident in each lesson. Bessie learned how to record a unique voicemail that spread the gospel as well as let dialers know to leave their name and number after the tone. When it came to creating strong passwords, Bessie offered to recite a Langston Hughes poem from heart, just to give everyone a little inspiration. Beyond her magnetic personality, Bessie was also a gifted learner. She took easy to tablet lessons, even with very little prior experience, and spent the end of most classes helping other students catch up. From the very beginning, Bessie was happy to share what the Connect @ Home class meant for her. “We are alive today, and we should make the best of it! If we don’t learn to catch up with technology, we’re dead in the water,” she explained. By far, Bessie’s favorite lesson was the class section on Google Hangouts. That week, their CTN trainer, Calvin, had left on a personal trip to Taiwan and helped plan a Hangouts call with the class half a world away. Bessie lit up and exclaimed, “My my, it is so good to see you!” much to the pleasure of everyone involved. It was a moment she knew was possible today, but one she never thought she would be a part of. Folks like Bessie always transform our CTN classrooms into small communities. CTN is so thankful to have had Bessie in the Austin Connect @ Home class, and we hope she continues to make North Loop a wonderful place for years to come.